Eight centuries ago battlemented parapets raised their bold turrets around the town of Calaruega, standing by the Roman road some thirty miles northward from Osma, the Episcopal see of Old Castile. These medieval walls guarded the castle of the Guzmans, a family of Visigothic knights whose chivalry was famously jealous of its Christian faith as well as of its family honor. Within this ancient town and of this blue-blooded Guzman stock Saint Dominic was born, about 1170. His father, Felix, seems to have been happily blessed with the qualities of Chaucher’s “perfect, gentle knight,” although we know but little more about him. His mother, Joanna d’Aza, had strains of Europe’s noblest blood, and so renowned was her sanctity that she was beatified by Pope Leo XII. Besides Dominic, two other children of this union lived saintly lives, one, Mannes, having also been beatified. Marvels accompanied Dominic’s birth. Before her delivery, his mother dreamed that she bore in her womb a dog, and that it escaped from her, holding in its mouth a burning torch, with which it set fire to the world. On the day of his baptism the godmother of the Saint had a vision in which the blessed child appeared to her marked on the forehead with a radiant star, the splendor of which illuminated the entire earth. Dominic’s infancy was passed amid ordinary circumstances. At the age of seven Saint Dominic's parents placed him under the tutelage of his maternal uncle, a parish priest at the collegiate church of Gumiel d’Izan, not far distant from Calaruega. Here the young lad received his primary instructions, which, according to the medieval custom, consisted mainly in reading from the Latin Fathers. His piety was already intense, and he would wander into the church to listen to the chant, or when his mood so disposed, he would sit a long while gazing at the paintings in the church, which made their appeal to his religious instincts. When fourteen, Saint Dominic left his uncle’s care and entered the schools of Palencia, then the best in Spain. Even at this youthful age he probably had a canon’s title, which defrayed the expenses of this long education. His course at Palencia lasted about ten years. The first five or six were given to the medieval arts course, including logic; the rest of his time was devoted to the study of theology. A serious student, Saint Dominic is said to have shown rather the mature gravity of an old man than the boisterous vivacity of a university student. Always he blended his studies with pious devotions. His charity was revealed at this period, during one of those terrible plagues which were the frequent scourges of medieval towns. In order to relieve the distress and misery of the poor of Palencia, he sold his books. Those were precious possessions before the invention of printing and were annotated by his own hand. The date of Saint Dominic’s ordination is not certain, but was probably 1194. Soon after this event he undertook his duties as canon at the Osma Cathedral. The new priest’s reputation for holiness and prudence must have preceded him, for the regular life of these canons was a reform measure, and Dominic was made sub-prior immediately. Two years later, when d’Azevedo became bishop of Osma, he appointed Dominic prior of the canons. The nine years of hidden life at the cathedral were given up to the holy practices of conventual life. At once he began to appear among his brother canons as a burning torch, the first in sanctity, the lowest of all in humility, shedding around him an odor of quickening life, a perfume like incense on a summer’s day. Like an olive tree which throws out its branches, like a growing cypress, he grew in holiness. He remained day and night in the church. One special demand he constantly addressed to God, that there might be bestowed on him a true charity, a love which should count nothing too dear for the salvation of men. He was accustomed to read the Gospel of Saint Matthew, the Epistles of Saint Paul, and The Confrences of the Fathers, by Cassian. These books, assisted by divine grace, raised him to a purity of conscience, to abundant illumination in contemplation, and to an eminent degree of perfection. At length this quiet, contemplative life was intruded upon. In 1203 Dominic’s bishop, Didacus d’Azevedo, took him on a diplomatic journey to Denmark, there to arrange a marriage for the son of King Alfonso VIII of Castile. This journey brought them through southern France, and thus occasioned the directive inspiration of Dominic’s life. It appears that one night, while lodging in an inn at Toulouse, Dominic discovered his host was an Albigensian, an adherent of the pernicious heresy then demoralizing Languedoc. With a newborn apostolic fervor he ingeniously threw himself, heart and mind, into the work of rooting out his host’s errors and of implanting again the true faith in the misguided soul. He argued all night, we are told, with a sweet and kindly charity, and won his host over to the truth of the Catholic faith. From that time, he cherished in his heart the project of spending himself for the salvation of misbelievers, and of instituting to that end a preaching Order, to be devoted to the evangelization of the nations. With this fresh inspiration hot in his heart, Dominic’s interest in his bishop’s mission must have flagged. Nevertheless, he journeyed to Denmark, made the necessary negotiations, then returned to Spain and with a large retinue began the second trip to the north to fetch the young betrothed. When they reached Denmark the second time he and his bishop attended the obsequies of the fair lady for whom they had come. Then the retinue was dispatched to Spain with the sad news. But Dominic and his bishop went to Rome, presumably because of a mutual desire for missionary work among the heathen Cumans who inhabited the steppes of Russia. For this pious project they sought the papal sanction. Innocent III heard the apostolic desires of the two holy men, but saw a greater need for their preaching among the Albigensian heretics. He instructed d’Azevedo to retain his bishopric and to preach in southern France before returning to Spain. Dominic, likewise, was to preach with his bishop. Leaving Rome with the pope’s blessing, the commissioned preachers went to Languedoc. Early in 1205, Didacus and Dominic arrived at Monpellier, just as the Cistercian missionaries were holding a conference to discuss whether or not they should discontinue their preaching on account of their meager success. On becoming aware of the presence in the town of the Bishop of Osma and his companion, the Cistercians asked their counsel on the gloomy outlook of the mission. The Bishop perceived that the rich equipages of the missionaries, while befitting their dignity as papal legates, were a source of scandal and were quite in contrast with the show of poverty practiced by the Albigensian itinerant preachers. With keen insight into the situation, Didacus and Dominic reminded the Cistercians of the importance of example in affecting the simple Midi folk. By pretentious holiness and by evangelical poverty, the heretics predisposed the people for the acceptance of their false teachings. The Bishop d’Azevedo, speaking also for Dominic, said, “The missionaries of Christ must drive out one nail by another; must put to flight the show of holiness by the practices of sincere religion.” He made it clear that the success of their preaching would be proportionate to the intensity with which they imitated the primitive apostolic spirit. This apostolic spirit could be had only by extreme sacrifices. This, in substance, was the Bishop’s counsel. Hard indeed it was, but it was received in the spirit in which it was offered. B his encouragement and inspiration, Didacus created a new zeal in the preachers. After the conference was finished the Cistercians sent away their magnificent retinues and, following the example of Didacus and Dominic, went about on foot to preach in any place they could win a hearing. Besides the feature of evangelical poverty, a systematic method of conducting the instruction of the heretics was now adopted. A series of public debates was arranged, in which the Catholic missionaries matched their arguments with those of the most skilful heretics. This mode of missionary activity, more modern than medieval, seems remarkable. Another striking practice is even more interesting. This was the practice of balloting at the end of each discussion, by which the auditors signified which side they thought victorious. One of he liveliest of these religious debates was held at the town of Servain, in which Saint Dominic had a notable victory. The discussion lasted seven days. Each day the most acute and adroit of the Albigensian teachers hurled at him their most terrific blows. But after the week’s debate there was a popular acclamation of Dominic’s victory. So please were the people that they followed him and his companions for three miles out of the town. Dominic’s earnest efforts for the dissemination of Catholic truth continued with varying success – now more, now less. He visited every town and village in the Midi, instructing where and how he could – sometimes on the public square, sometimes in the most spacious room of a castle, sometimes in a church. His headquarters were at Fanjeaux, where the Bishop of Toulouse granted him a chaplaincy. He had six companions. They were all priests, mature scholars and generally well equipped to render the greatest assistance to him in his preaching, which at this time was still under the direction and authority of the Bishop of Osma. Probably the most consoling incident during this period was the conversion in 1206 of nine female heretics. They came to Dominic, confessing that their hearts had been drawn to him by the beauty of the doctrine he expounded in a recent open-air sermon. They declared that heretofore their minds had been deceived by the heretic leaders, for they truly thought these false teachers were good men. Dominic graciously received these nine women back to the faith, but was not content with this. He threw about them the protection of the cloister. They became the first community of Our Lady of Prouille, the mother house of all Dominican sisters. In this work he was aided by Bishop Foulques of Toulouse, who granted to the community the revenue of the Church of Our Lady. The prelate also donated a neighboring house, in which the little community lived and grew in fervor under the saintly founder’s spiritual guidance. 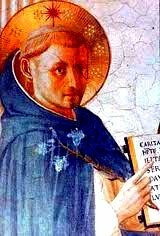 Dominic’s joy over this first foundation was counteracted in 1206 by the sorrow of the departure of the Bishop of Osma, who, in accordance with the Pope’s orders, returned to Spain. Shortly after the nuns were established at Saint Mary’s, Prouille, a neighboring house was opened for the associates of Dominic. Besides the preachers, he had a couple of helpers, who later on became lay-brothers. These lay helpers attended to all the business concerns of the nuns. Not until 1215 did the Preachers receive definite organization. This was by the recognition of Bishop Foulques, who approved them as a diocesan congregation. But this local character was not in keeping with the universal apostolate of which Dominic dreamed. Consequently, when he went to Rome in 1215, as consultor to Bishop Foulques, at the Fourth Lateran Council, he requested Pope Innocent III to give papal sanction to his Preaching Order. Grave difficulties were in the way of such a confirmation, because the council, then in session, expressly laid down restrictions against the multiplication of religious orders, with provision that all future communities must adopt one of the existing rules. Saint Dominic was greatly saddened by the loss of souls of those who had embraced the Albigensian heresy, and so he had a lifelong apostolate among heretics, especially Albigensians, in France. He founded the Order of Friars Preachers (Dominicans) in 1215, a group who live a simple, austere life, and an order of nuns (already mentioned) dedicated to the care of young girls. We can hardly help dwelling for a moment on Saint Dominic’s outer appearance, since it was the shrine and expression of the inner soul. Everything about Saint Dominic betokened the finest fabric of a human existence; the figure more than medium; the long, gracefully molded fingers; the shoulders slightly bent, as if in hourly deference to all; the noble head nobly crowned with a corona of auburn, flashing golden in the sun; the sweet smile, so homely on his cheeks; the tender, resolute, pathetic, sympathetic eye – a very lamp of light set in a brow of amber ivory; and then that mystic nebula that glowed from his forehead, filling the dark souls of the despairing with peace and bringing thoughts of God and of the angel-trod cloisters of the Great City nearer to the hearts of men. Legend says that Saint Dominic received a vision of a beggar who, like Dominic, would do great things for the Faith. Dominic met the beggar the next day. He embraced him and said, "You are my companion and must walk with me. If we hold together, no earthly power can withstand us." The beggar was Saint Francis of Assisi. St Dominic asked St Francis for his cord, which he was given to wear, thus becoming a cord bearer of St Francis of Assisi. At the home of Cardinal Ugolino Saint Dominic met Saint Francis of Assisi; this was the second meeting of the Saints, for they met before, on an earlier visit of Dominic in Rome. The two Saints became the warmest friends. Both had similar aims; both were burning with divine charity for the salvation of souls and, although by diverse means and with distinct spirits and geniuses, both worked harmoniously together. Perhaps no sainted friendship has received such a happy perpetuation. On the feast of Saint Francis Domincans celebrate the Mass and are honored guests at the Franciscan friaries, and on the feast of Saint Dominic the compliments is returned by the Fanciscans. At one point Saint Dominic became discouraged at the progress of his mission; the heresies remained. The Blessed Virgin came to his relief, as he received a vision from Our Lady who showed him a wreath of roses, telling him to say the rosary daily and teach it to all who would listen. Eventually the true faith won out, as Saint Dominic’s words rescued countless souls, and three times he raised the dead to life. He is often credited with the invention of the rosary, but it predates him. Saint Dominic founded the Dominican Order, which grew at a rapid pace. On one occasion at San Sisto Saint Dominic and his brethren had to suffer from hunger. In the morning several of the friars had been sent out to beg, but they had given to the poor the few loaves they had received. When Saint Dominic was told there was no food, he had the signal given for the meal. By this time there were about forty people in the convent, and the friars came and recited the prayers of grace. Whilst each one, seated in order, awaited the meal, two young men of comely aspect entered the refectory with white cloths hung from their necks, in which they carried bread sent by the Celestial Breadmaker. In silence the two messengers placed loaves first at the lowest tale, and so on up to the place occupied by the Blessed Dominic, and then they disappeared without anyone having attained to the knowledge of whence they had came and whither they were gone. During the installation of the sisters at San Sisto a great miracle was performed by Saint Dominic. Cardinal Orsini's nephew, named Napoleon, was killed by falling from his horse. The messengers broke into the chapel and informed the cardinal-uncle of the youth's misfortune. In extreme grief Orsini whispered the news to Saint Dominic, who with characteristic charity gave orders to have the corpse brought to the convent. The body, having been brought in, was laid on the chapel floor. Before it Saint Dominic said Mass for the youth. Then, standing by the mangled body, he cried in a loud voice, "Young man, Napoleon, I say to thee, in the name of Our Lord Jesus Christ, arise." In the sight of the cardinals, nuns, and friars, the young man arose alive and without a sign of the least injury. On August 6th, 1221, Saint Dominic died of a fever. Thirteen years later he was canonized by his friend, Cardinal Ugolino, who had become Pope Gregory IX.